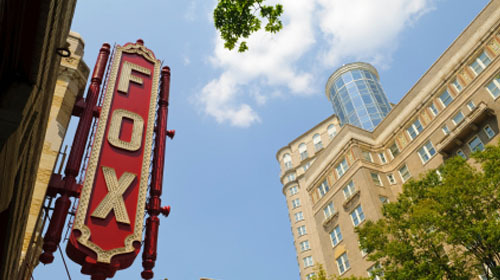 An abundance of theatres, museums, art centers, and festivals are offered in North Georgia to appease the art and cultural tastes of people of all ages. Surrounded by the scenic Blue Ridge Mountains, North Georgia is a hodgepodge of some of Georgia’s finest arts, music, theatre, golf, and cultural festivals. 1. Center of Human Rights; The Center for Civil 4 and Human Rights in downtown Atlanta is an engaging cultural attraction that connects the American Civil Rights Movement to today’s Global Human Rights Movements. 2. High Museum; With its renowned collection of classic and contemporary art and award-winning architecture by Richard Meier and Renzo Piano, the High Museum of Art has grown from its origins in a stately home on Peachtree Street to become the leading art museum in the southeastern United States. 3. Georgia Aquarium; Georgia Aquarium is the world’s most inspiring aquarium with over 8 million gallons of water the top Atlanta attraction, right in the heart of downtown. 4. The College Football Hall of Fame; The College Football Hall of Fame and Chick-fil-A Fan Experience open in downtown Atlanta provides visitors with a highly-immersive, interactive, and engaging experience using a blend of historic college football artifacts and state-of-the-art, interactive multimedia exhibits. 5. Stone Mountain Park; Located on 3,200 acres of natural beauty, Stone Mountain Park features a wide variety of fun family activities and things to do such as dozens of fun annual events. Stone Mountain activities are suitable for all ages. 6. World of Coke; The World of Coca-Cola is the only place where you can experience the fascinating story of the world’s best-known beverage brand in a dynamic, multimedia attraction. 7. Fernbank Museum of Natural History; Only at Fernbank Museum can you come face-to-face with the world’s largest dinosaurs, explore the development of life on Earth through the landscapes of present-day Georgia, connect with cultures from around the globe, engage in a variety of hands on and special exhibitions including an incredible 5-story experience of an IMAX® film. 9. Six Flags Over Georgia; The park boasts 12 heart-pounding roller coasters headlined by the hyper-coaster Goliath, ranked as one of the top coasters in the world and Dare Devil Dive, a beyond-vertical coaster that sends you soaring through three inversions. Cool off on Thunder River, a wild rafting adventure or splash around at Paradise Island, a towering water play structure with hundreds of water elements. 10. Atlanta Cyclorama; Visit the Cyclorama in Atlanta’s Grant Park to see artifacts of the war displayed in the Civil War Museum and a steam locomotive known as the Texas, a veteran of the Great Locomotive Chase of 1862. North Fulton is home to a multitude of parks, playgrounds, gardens and other greenspaces. There are even dog parks for your four-legged friends to run around off-leash. This list is far from exhaustive, as it doesn’t take into account many of the neighborhood parks, pocket parks and passive spaces scattered throughout the county. Keep in mind that some of these parks are run by the county parks and recreation department, while others are run by the city in which they are located. For more information, visit www.fultoncountyga.gov. North Fulton County has a wealth of entertainment options for families. Explore everything from symphony performances and arts festivals to museums exhibitions and hiking trails. Below are just some of the family attractions North Fulton has to offer, along with websites for more information. AAC is the county’s oldest neighborhood arts center and offers day and evening classes for both children and adults. Enjoy go-karts, food and games at this facility named after racing legend Mario Andretti. The preserve includes 46 acres of ravine forest as well as 2 miles of walking trails and a Heritage Village that recreates life in the 19th century. Located just off Roswell Square, this 19th century home features the metro area’s only antebellum garden. This antebellum home is best known as the location of the marriage of Mittie Bulloch and Theodore Roosevelt, the parents of future U.S. President Teddy Roosevelt. The metro area’s largest nature center features a butterfly garden, native plant garden and a green room garden in addition to children’s programming and hiking trails. This family-run business boasts 173 acres of pastures and woods and hosts polo events throughout the year. Open since 1993, this ensemble is the resident professional theater at the Roswell Cultural Arts Center. This sprawling complex includes gardens, a nature walk and an entertainment lawn, as well as the Williams-Payne House which houses the Heritage Sandy Springs Museum. Comprised of professional musicians from across the metro area, the symphony is under the direction of founder J. Wayne Baughman. Featuring a 600-seat theatre as well as meeting rooms, exhibits halls and a research library, and hosts events from puppet shows to corporate meetings. Visitors to this historic site can see the remains of Roswell’s cotton mills and tours tell the story of the “Lost Workers of Roswell,” who were charged with treason and sent north during the Civil War. The perfectly preserved home of one of Roswell’s founding fathers includes a two-story farm house, outbuildings, slave quarters, barn and carriage house. Open since 2008, this 12,000-seat amphitheatre hosts a wide range of concerts and, during the summer months, is home to the Atlanta Symphony Orchestra.